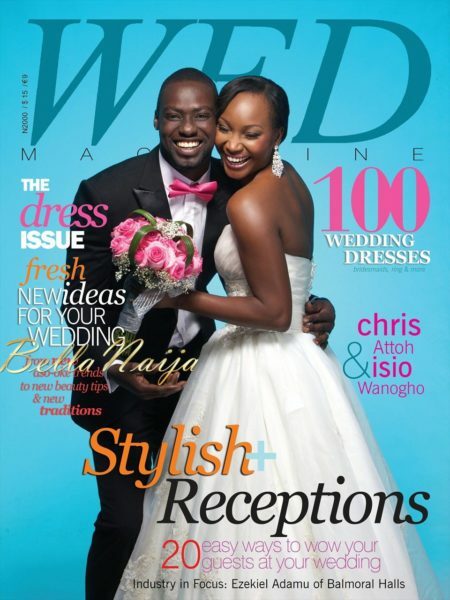 Aww…Ghanaian actor, Chris Attoh and Nigerian model, Isio Wanogho look gorgeous on the cover of WED Magazine’s Dress Issue. Donning a white ball gown with a sweet heart neckline accessorized with diamond earrings and a colorful bouquet, Isio Wanogho smiles on with Chris Attoh, dapper in a black suit with a fuchsia bow-tie on the cover of the new issue. 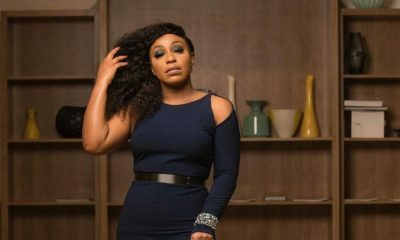 Inside the pages of the magazine, the two personalities who are also entrepreneurs according to the mag, strike different poses in more outfits. 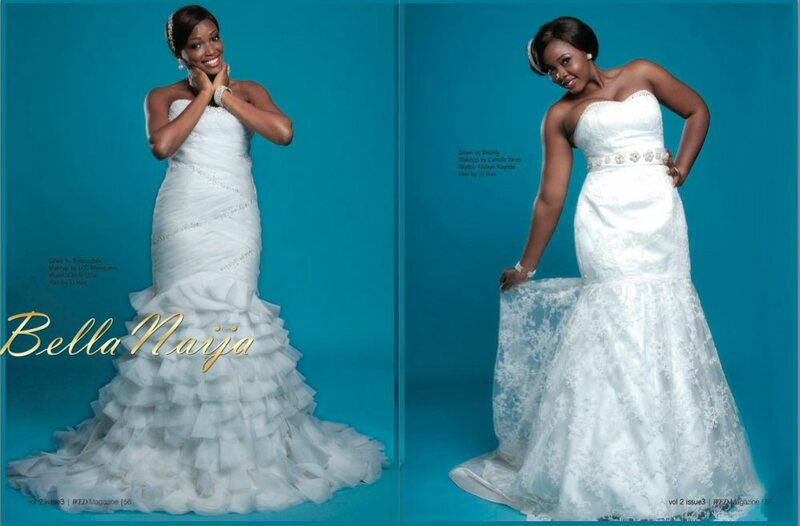 This 256 pages edition of the foremost wedding publication, is also packed with lots of tips and ideas to make your big day a memorable one. 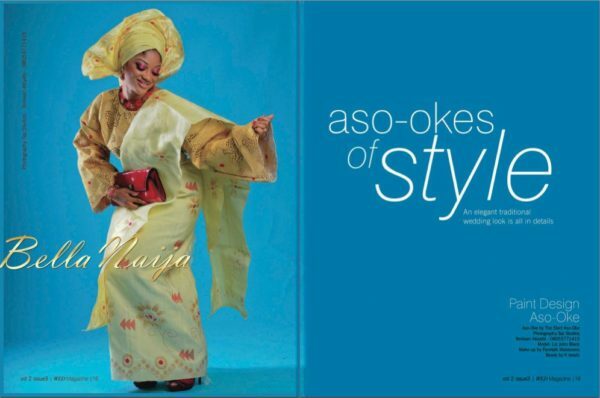 From ways to wow guests at your wedding to new aso-oke trends and beauty tips, even to creating your own traditions. 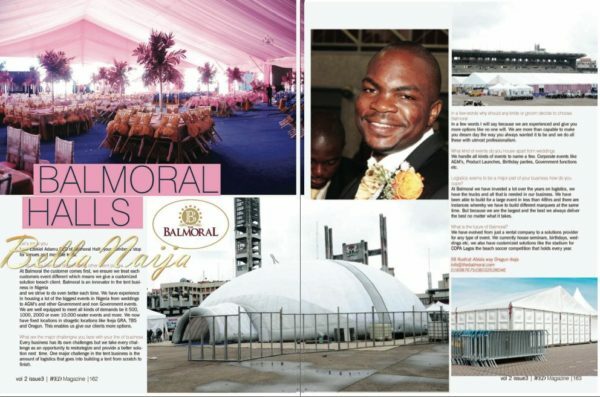 Also in this issue, Ezekiel Adamu of Balmoral Halls, speaks on the challenges of his business and the future, Nigerian cake maestro, Tosan Jemide of Cakes by Tosan dishes on the success of his business, his memorable creation and lots more. WED Magazine’s Dress Issue is currently available on newsstands, be sure to ask you vendor for a copy or call 07001111933 | 07086390607 for a sales location. nice and handsome picture,,, great!!!! oooh I want this Mag. 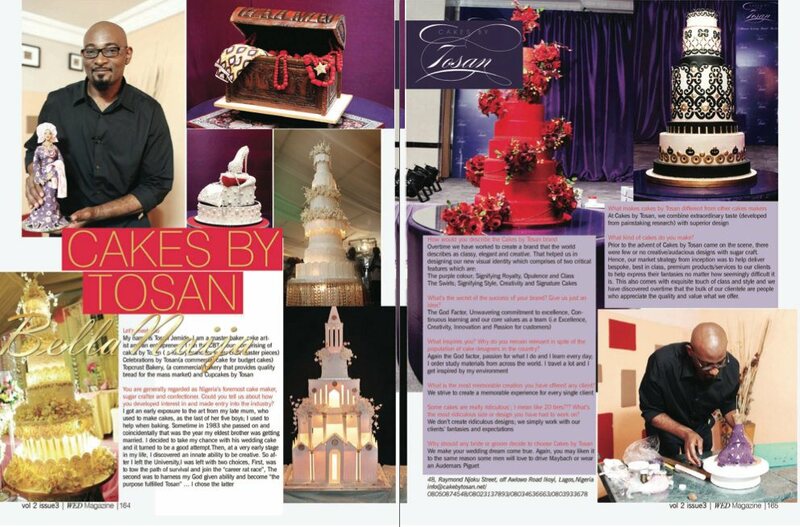 Cakes by Tosan are just fab! Woooow,does cakes r too good to b true…. 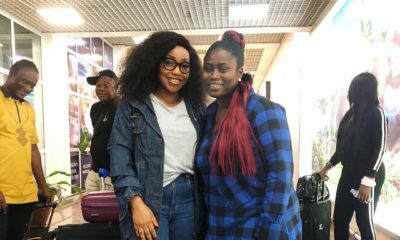 IM BEGINNING TO SEE ”LIZ JOHN BLACK” EVERYWHERE, I REALLY LIKE THE GOLD/YELLOW ASO-OKE ATTIRE SHE HAS ON. The cakes are wow!!! Isio and Chris look a good match. 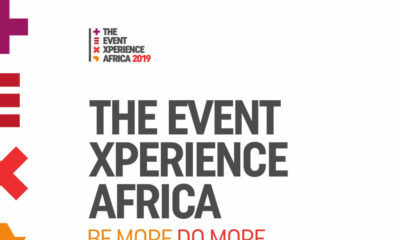 Where on earth did chris get that ToXido…..wow,That’s what am talking about …please leave me with the number or contact of the designer…Thanks. Hi Jerry, the designer is La-Meda, you need to see his other stuffs,he’s the bomb!!! Give me some Isio skin complexion secret! I’m a girl,but I don’t droll over guys as some girls do,may be because I luv my fiance so much? so what should we do about this relevant information you’ve provided?remove our bras and use as binoculars? abi make we mop atlantic ocean? What’s with Chris listening to Isio’s tummy tho? what’s the message? That brides have to be pregnant before wedding day? I wondered about that pose too. This shouldn’t have been added to the final product. You are reading it wrong. third pose, they are equally both into each other. i beg take seat…na only u do English Literature for school? When is GENI going to get married God!!! La-Meda, nice job with the tuxedo….perfect cut and fit as usual.